All too often one hears the repeated lament that the reason for boom and bust, widespread poverty, the increased inequality of incomes, endless warfare and whatever else happens to be plaguing the world today in the eyes of the saintly commentator are all because people are afflicted by greed. “If only people weren’t so greedy then everything would be fine!” chants the typical appeal. On the other hand, the virtue of altruism is held in immeasurably high esteem – selfless benevolence at one’s own expense is regarded as the pinnacle of human endeavours, with societies and cultures often reserving their most coveted honours and elevations for people who have apparently undergone acts of remarkable generosity. Although we may judge the outcomes of “greedy” or altruistic acts, there is nothing in either libertarianism or free market economics that states categorically that either is good or bad. This is contrary to ill-informed opinions on these subjects, and, indeed, to the thought of some free market proponents who adopt the “greed is good” mantra. Rather, libertarians qua libertarians neither promote nor condone any voluntary act, whatever its motivation; they take only the position that such acts should not be countered with violent repressions. Whether such acts are good in and of themselves, on the other hand, is another matter. Similarly, free market economists will note that although voluntary exchanges create net wealth (including gift giving in which the donor gains a psychic profit from the benefit bestowed upon the recipient) there is no part of their science in and of itself that compels them to promote or encourage giving any more than they are required to promote, say, demanding the highest possible price for what you sell. Nevertheless, as private individuals, it is natural for libertarians and free market economists as much as anybody else to regard selfish, mean, despicable, yet voluntary acts as reprehensible; and, conversely, to regard overt acts of kindness and generosity as worthy of praise and adulation. The former situation usually occurs when an individual refuses to incur a clearly trivial cost that would confer a disproportionately large benefit on someone else (such as dialling 999 on one’s mobile phone for a victim of an accident); the latter situation, on the other hand, usually occurs when the donor accepts the risk of a very grave cost, such as wading into a strong river to save a drowning child, or parts with a significant quantity of his material wealth for the benefit of others. It will be argued in this essay that the correct place for condemnations of “greed” and celebrations of “altruism” is firmly within this realm of specific situations involving specific individuals where the ends, means, choices and costs can be empathetically appreciated with relative clarity. What will be disputed is the erroneous extrapolation from these individual, voluntary acts the conclusion that economic progress, the vanquishing of poverty and the path towards a greater material standard of living are themselves dependent upon curbing “greed” on the one hand, and promoting altruism and self-sacrifice on the other. In other words, the notion than the systematic regulation of these behaviours is a requirement of material progress will be shown to be false. This error is similar in nature to another error encountered in mainstream economics – that of supposed shortages of “demand” on an economy-wide scale. In the particular situation of an individual firm or industry, a withdrawal of demand from the firm’s products will result in a slowdown of business for that firm. If the firm is to recover then it is obvious that a recovery of demand for its goods and services is necessary. However, derived from this entirely correct conclusion regarding a particular circumstance is the utterly false conclusion that increases in demand must benefit the economy as a whole. Or, in other words, that where there is a general economic malaise the effective response should be to encourage a general increase in demand for an alleged “glut” of supply. As we know from Say’s Law, however, demand and supply are opposite sides of the same coin – the demand for one product is formed by the supply of another, transmitted via the medium of exchange. Therefore, one cannot increase general demand without also increasing general supply, i.e. the production of real products. Simply printing more money or lowering borrowing costs does nothing to increase demand; it simply raises the prices of what is already available and shifts the purchasing power over these existing resources from the later recipients of the new money to the earlier recipients. The real problem in an economic bust is a relative oversupply of some products, namely, capital goods that are further up the chain of production, and a relative undersupply of other products, namely consumer goods and lower order capital goods. So too is a similarly false conclusion drawn with regards to greed, altruism and self-sacrifice – that what may be good or bad in one, specific situation is good or bad for society as a whole; and, moreover, these things are so good or bad that the state should systematically force us all away from greed and towards altruism and self-sacrifice. In the third part we will examine the fact that the greed and altruism are conflicting opposites only in a zero or negative sum environment, whereas they can co-exist in a positive sum environment such as the free market. It will be concluded that, when it comes to the question of economic progress, the method of accumulating wealth is the important factor, whereas the motivation is, at best, a secondary consideration. Let us, then, turn first of all to an analysis of “greed”. To any accusation of “greed” there seem to be three strands. First, that the alleged perpetrator possesses an “inordinate or insatiable longing for unneeded excess, especially for excess wealth, status, power, or food coupled with the intention to keep them for one’s self, far beyond the dictates of basic survival and comfort”.1 Second, that other people are prevented from benefiting from this accumulation. And third, that only some people are afflicted by this menacing motivation whereas the rest of us are apparently content to languish in undemanding modesty. To some extent this third strand is a corollary of the first and second; excesses can only be measured from a point of regularity and at least one of those regularities is that which everyone else either possesses or is content to possess. In other words, greed is not “normal” behaviour. Given that this essay concerns economics and material prosperity, we will focus the discussion on greed as it relates wealth, rather than to power or status, except to say that all three are, more or less, joined at the hip. Power is normally impossible to attain without also having sufficient command over resources, even if indirectly; status may be attained without material wealth (for example, Mother Theresa) but, more than likely, it will come with the ability to earn it. Taking the first strand of greed, if some people desire some kind of excess then we are entitled to ask how we assess this magnitude. Even if we can only form a rough or general opinion, if something is excessive then we need to know what we are measuring and at which approximate point of the scale acceptability is divided from excess. One possibility is that we attempt to gauge the value that a person’s desires would bring to him/her subjectively – what we might call “psychic income”. In other words, a possession makes one person exceedingly happy while leaving everyone else to languish in a state of content far below this. Why, however, should this condemn a person as being greedy? If I get an immense amount of utility out of something that is, to all intents and purposes, useless to anyone else what harm is this causing? Is it wrong for me to gain pleasure where others do not? If I possess something that makes me the happiest person alive, yet is, to everyone else, of little or no value, is this really a problem? This may sound like an exaggeration, but when you consider that many people have in their possession objects that, to them, carry great personal sentiment – wedding rings, photo albums, etc. – whose market value is but a pale reflection of the value they hold for the owner then it is not so far fetched. Of course, the real target of criticism is likely to be the hedonist or the materialist who sees a general excess of value in objects and things rather than having a sentimental attachment to just a few personal items. We might as well also include in this category those who have an irrepressible appetite for consuming food. However, it is still the case that none of this need be much of a bother to anyone else. As disgusting as the behaviour of the most gluttonous individual may be, he/she would be unable to consume barely a fraction of the food available in a small convenience store – at least not in relatively capitalistic societies (Venezuela might be another matter). Moreover what are we to make of ascetics, who derive value from shunning material possessions? If this makes them “unduly satisfied” are they to be characterised as greedy for their “excessive denial” of sensory pleasure? We may laugh or scoff at the behaviour of the materialist, the hedonist, the glutton or the ascetic, and we may criticise such behaviour on other moral grounds. But given that their actions are not, directly at least, preventing any kind of benefit to anyone else this route of trying to understand the concept of greed seems absurd. A second possibility is that we attempt to determine a person’s greed by the market value of his desires or possessions. An initial problem that we might as well point out is that the market value of an object is simply a hypothetical price that someone might pay if offered the object for sale. Strictly speaking, market prices are only estimates and are subject to constant, unceasing change. Real prices in real transactions are historical events that need not bear any relation to future events. But leaving this quibble aside let’s assume that a person’s possessions and/or desires, either individually or collectively, command an exceptionally high market price. 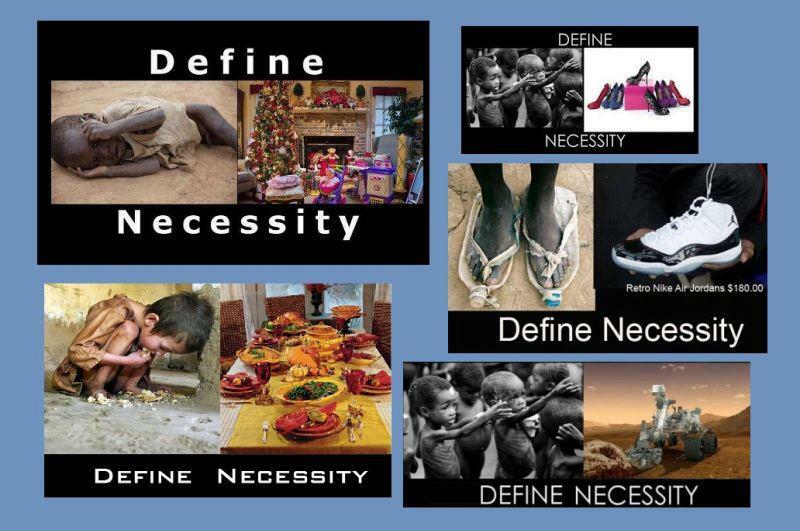 What this tells us is that everyone else values those possessions or desires extremely highly also. In other words, these possessions are expensive precisely because everyone else wants to own them too, and so any accusation of greed must be based on the desires of everyone else as much as those of the alleged greedy individual. This route of determining greed is clearly more plausible as now we are confronted with behaviour which affects everyone else – in other words, the greedy individual is apparently causing some kind of deprivation to others. The problem, however, is that we have called into question the third element of greed, which is the idea that only some people are greedy – the “haves”. Everyone else is supposed to be spared the condemnation. But if a person’s greed is determined by the propensity of his possessions to attract covetousness, how likely is it that the “have nots” would refuse the offer to have their wealth increased beyond the so-called “dictates of basic survival and comfort”, even if it meant that no one else’s was? The evidence would seem to suggest that it is not very likely at all. According to one source, more than 45 million people – 70% of the eligible population – play the UK National Lottery regularly.2 Is it not the case that all of these people want to advance their own wealth to a great height? This can be at least several million pounds worth in the regular lottery game while the jackpots in “Euromillions” game can run to over an extraordinary £100m after repeated rollovers. Isn’t it also true that they each wish to be the only winner while leaving everyone else to languish as losers? Some of them might, of course, give a significant proportion of their winnings away, but it is unlikely that the majority of lucky winners would prioritise this ahead of improving the lives of themselves and of their families. “Greed”, therefore, appears not to be an isolated motivation but one that is shared quite commonly. Indeed, it is part of the human condition to always seek improvement to one’s current state of affairs. Every human action is an attempt to substitute more desirable ends for less desirable ends with the means available. If we gain more means then it is obvious that we can satisfy more of our goals. To seek an end to this is to replicate the fallacy on which so many political philosophies have foundered – that the natural condition of man, with all of his qualities and faults, can somehow be moulded or changed. Further, as a result of this unceasing appetite for improvement “the dictates of basic survival and comfort” change with each generation. In the second decade of the twenty-first century no one thinks that you are greedy if you can afford a house, a car, a telephone, a refrigerator and an annual foreign holiday. Indeed, not having access to these things may serve to classify you as being in need of help. On the other hand, in the same decade of the previous century such possessions would have been the epitome of ostentatious luxury. As demand is often elastic it has always been the case that what has started out as luxury consumption of the rich has inspired entrepreneurial activity towards mass production until supply can be increased so heavily that even the poor can afford what was once a symbol of great wealth. Any attempted measure, therefore, of “the dictates of basic survival and comfort” is entirely arbitrary. Here, then, lies the heart of the problem of defining and identifying greed. “Greed” is a motivation which, as we have shown, is held quite commonly and is difficult to distinguish from general, purposeful behaviour. Given these difficulties, therefore, accusations of greed are thrown not at these mere motivations, which would condemn everyone in the absence of a yardstick. Rather, the ire is directed instead at relative outcomes – i.e. that some people end up being better off than others. In other words, it criticises success in fulfilling one’s greed rather than greed itself, and that successful people spend their money in ways which they prefer rather in ways that are preferred by the observer. As we said earlier, these judgements may be perfectly reasonable in specific situations, particularly if we can observe pressing needs which are within the perception and grasp of the “greedy” individual at little cost to himself while he chooses not to address them. However, if we can only identify greed through analysing relative outcomes, how do we do this in a large, complex economy of tens of millions of people where it is not possible to carry out investigations case by case and the relationships between all of these individuals is remote and faceless? Here, the motivations of the critic – who has to resort to demanding a more blanket “redistribution” of wealth from the rich to the poor – become more suspect. Either they are buoyed by another of the seven deadly sins, which is envy, or they are mindlessly devoted to some conception of egalitarianism. We can say a few brief words about each of these. Commenting on the advocacy of redistribution from the “rich” to the “poor”, Thomas Sowell suggests that the envious are at least as guilty of greed as the successful when he says “I have never understood why it is ‘greed’ to want to keep the money you’ve earned, but not greed to want to take somebody else’s money”.3 Yet we could point out that the envious are in a worse position than the successful. After all, the successful are just greedy, whereas the complainers are guilty of both greed and envy. Moreover, “greed” is usually only identified in the apparently “undeserving” rich such as businessmen and entrepreneurs. Movie and sports stars tend to escape admonishment, probably on account of the fact that, in spite of their endeavours amounting to little more than the production of entertainment, their talents and achievements are readily appreciable. On the other hand you have to follow a chain of reasoning to understand the important role of, say, a company executive. We can conclude from this that ignorance is also part of the equation. As for those piously wedded to egalitarianism, they fall victim to the “zero sum” mentality of a market economy that we will examine below, a consequence of which is that they would rather make the poor poorer so long as the rich were less rich. Such policies have only been attractive at their inception; once the reality sets in “greed” is eliminated only because people struggle to achieve even the “dictates of basic comfort and survival”. The difficulties inherent in identifying and addressing greed across an economy as a whole will become clearer when we move on to our second topic which is discussing the equal difficulty of appraising altruism on such a scale and attempting to “enforce” it through state redistributionism. However, we should first close this examination of greed by noting that pervasive, societal wide greed, receives its biggest adrenalin shot through the artificial expansion of credit associated with the “boom” phase of the business cycle. This is where the first receivers of newly created money can plough it into assets and benefit from the resulting inflation, making themselves very rich while leaving the “real” economy to languish. The resulting disconnection between rising prices and real values induces the belief that wealth is attainable not through hard work and productivity but simply through borrowing money and riding the wave of rising asset prices. For example, it was once thought necessary to have a job in order to buy a house; but during the housing boom of the 2000s this sensible logic was flipped – you no longer needed a job if you had a house. Such an illusion is the basic one that is shared by all monetary cranks – that it is possible to make bread out of paper. Once the whole thing comes crashing down and many of the later players, who bought at the very top, are left with egg on their faces, then accusations of runaway greed for all of the wealth that was chased and lost abound. It is clear, however, that greed here is a symptom of the underlying problem of credit expansion which results in wild booms and busts. It was not their cause and it would not have occurred without this prior state interference. Second, the very motivation towards altruism is most often dependent upon a close family or friendly relationship between donor and recipient where the welfare of the latter is of great importance to the former. Such a motivation is destroyed when your money disappears into a bureaucrat-run black hole. The result is that, as people lose the ability to spend their money in ways that they want, the motivation towards producing wealth in the first place is destroyed. There is therefore less wealth to distribute anyway. Critics may, of course, argue that such a result is owing to the alleged “selfish” and self-centred nature of humans and that surely we – i.e. the state – has a duty to attempt to overcome this? There are at least two responses to this. First, it is part of the natural condition of humans that the primary ends and values that they hold are concerned with their immediate environment – that is, the welfare of themselves, their friends and their family; in other words, people whom they know, care about and have the ability to form empathetic judgements about. It is the stimuli from these sources that most potently determine our desires and choices. Everything else that goes on in the world is, for the most part, out of sight and out of mind – or, at least, it is sufficiently remote that it can be brought to us only electronically through the media in which we can view it in the relative comfort of our living rooms. Indeed, many people are unlikely to be able to appreciate the immediate conditions, needs and desires of people in another neighbourhood in the same town. People do, of course, devote themselves to causes that aim to help people far away about whom they may know very little; but these are specific causes towards which one may have a specific motivation. Enforced wealth redistribution, however, aims at ameliorating hundreds, if not thousands of afflictions across many millions of faceless people. It is simply not possible for any human to form empathetic appreciations of all of those individual circumstances and, thus, neither will they be able to appreciate any kind of amelioration of these afflictions (this is before we get into any discussion of whether wealth distribution does, in fact, accomplish such ameliorations). Therefore, it is not possible for the typical human to motivate himself towards striding towards providing for a giant pot that aims to solve these problems, or at least not to the same degree as he motivates himself towards providing for ends of his choosing. Moreover, we may ask whether a person with the ruddiest bleeding heart would, if it came to a choice, prefer to work towards contributing to the tax pot ahead of, say, caring for his sick and dying mother. Second, the very fact that wealth redistribution is forced (by the threat of imprisonment) rather than undertaken voluntarily does nothing to promote altruism in any way at all. Indeed, we might say that genuine altruism and selfless behaviour worthy of praise and recognition relies upon the fact that someone could have chosen, freely, to have done something “worthy” with his time and money as much as he could have chosen to do have done something “unworthy”. What we are praising the altruist for is the saintliness of having avoided the temptation to spend his resources on himself. When I am forced to hand over my money, however, I have in no way “behaved” altruistically; in fact I haven’t really “behaved” at all – rather the money was simply taken from me. I never displayed any feelings of generosity or selflessness because I had no choice to take the opposite path. Indeed, if anything, rather than encouraging any feelings of generosity, the forced appropriation of my property is likely to make me bitter and resentful and, moreover, to curb any desire to be generous with the remainder of the funds that I have left. To make matters worse, the welfare state does not leave the recipients of welfare spending as kindly and grateful beneficiaries who feel that they were lucky to have avoided misfortune. Rather, the welfare state begets a sense of “entitlement” and dissolution of personal responsibility – the mindset that it is the state’s responsibility to provide for their needs and that they have a right to the state’s assistance. Ironically, therefore, the welfare state itself increases antagonism and selfishness rather than promoting their antitheses. The erroneous, society-wide promotion of selfless altruism can be seen also in the elevation of those who devote themselves to so-called “public service” above those who compete in the allegedly greedy and grubby business of the private marketplace. Although appraisals of politicians have soured considerably in the past generation, it is still widely believed that private industry is where people go to make lots of money to keep for themselves, while those who seek public office shun such squalid and base motivations and, with their visions of a “greater” society, can almost single-handedly make everyone better off without a thought of any benefit to themselves. Indeed, taken to its extreme, it beggars belief that people are gullible enough to be hypnotised by the illusion that all of their hopes and dreams are dependent upon a tiny minority, or even (when you witness the almost messianic reverence devoted to presidential candidates) upon a single person out of a society of millions. It is in no doubt true, of course, that many people seek to enter politics with the desire, albeit the naïve one, to help people and to improve society. It may also be true that they could have amassed greater personal fortunes by seeking employment in the private sector. Nevertheless, all political accomplishments (other than the few and far between measures that seek to roll back the interference of the state) are not achieved with the politician’s own personal money. Rather, they always have to raid Peter’s pocket first in order to pay Paul. Even if, therefore, politicians were truly angelic and selfless, they could only be so with other people’s money – a far easier endeavour than being angelic and selfless with your own. But, of course, once they have pinched from Peter they are always eager to ensure that they take a healthy cut for themselves before handing over to Paul. For instance, the base salary (before expenses and allowances) of an MP in the UK is a little over £76,000 – nearly three times the average.5 And that is before we consider the salaries of the executive and the upper echelons of the bureaucracy where the real power is likely to lie. Thus the politician rewards himself handsomely for punishing other people’s greed and for being generous with other people’s money. This, combined with the destruction of the incentives to create wealth that we outlined above, hardly places the politician amongst the ranks of the exalted benevolent. All of the analysis thus far has dealt with greed and altruism while assuming that, in the free market order, the fundamental interests of each member of society are pitted against each other and that one person’s profit must automatically transform into another person’s loss. In other words, the profit and loss system results in benefits to the few (or, at most, some) at the expense of the many. From this incorrect assumption one naturally leads to the conclusions that the only way to benefit more or the many is if these profits (or the wealth that is possessed by the few) are turned over to them. This, however, is not the case, and, as we shall see now as we turn to the third part of our analysis, the positive sum environment of the marketplace actually means that greed and altruism are not polar opposites which intrude on each other’s territory. An initial fallacy in this regard is the notion that if one person has something then it is by virtue of the fact that another person does not have it. For example if I possess, say, an iPad then this possession is owing to the fact that someone else was deprived of that same iPad, and that what I have gained somebody else has lost.6 It is true, of course, that once I possess the iPad then I am entitled to prevent other people from using it – but this has nothing to do with how I achieved that possession in the first place. I have an iPad because I went to work and created goods or services that I exchanged for money which, in turn, I exchanged for the iPad. The iPad only comes into existence because I created the resources that enabled me to purchase it. If I had not so worked then it would not mean that someone else would have the iPad – rather, it simply wouldn’t exist. However, the more serious misconception concerning the zero-sum approach to the ownership of wealth is that one must be an owner of the societal stock of wealth in order to benefit from it.8 From this misconception it follows that only divesting wealth from those that have it and giving it to those who do not have it can ameliorate the plight of the poor and needy. This erroneous view is based on the image of the net wealth of the rich sitting around in a bank account somewhere, ready to be enjoyed as luxury consumption. The world’s richest individuals currently have tens of billions of dollars each – one is invited to imagine all of the plush homes and exotic holidays that may be bought with all of that. This view could not be further from the truth. The consumption spending of the productive rich, even on luxury items, amounts to a small proportion of their total wealth. The rest of their wealth exists because they have abstained from consuming it and have, instead, invested it in real, productive assets – factories, machines, equipment, and things that must be run by people with jobs. Their increased net wealth reflects the success of this enterprise in devoting scarce, productive assets to their most highly valued ends. We benefit from this investment of wealth in capital goods not by owning them but because they are able to produce more and more products and services at increasingly lower prices so that they become more affordable. Our standard of living therefore increases regardless of the fact that we do not own a large share of societal wealth. Indeed, we can even go as far as to say that we are better off because we do not own a greater share of societal wealth. This can be illustrated by adapting a well-known proverb: give a man a fish and he will feed himself for a day; invest that fish in a business that will produce fishing tackle that the man can afford and he will feed himself for a lifetime. The man in need neither owned that original fish nor did he ever get his hands on the capital goods that were produced from investing it. Yet it is clear that his life benefited from its investment in a productive enterprise to a far greater extent than if he had owned that first fish directly. If, on the other hand, the societal stock of productive wealth was to be liquidated and distributed amongst everyone else in the name of “sharing” or “combating greed” then you would have to destroy the entire productive apparatus of the economy and place it in the hands of those who do not have the capacity to invest rather than consume. Moreover, even if these recipients did wish to invest, they have either no or less of a proven ability to direct resources to their most productive uses. These resources would therefore be wasted and society would plunge to a grave level of impoverishment. The upshot of all of this is, therefore, that greed and altruism are far from being antagonistic concepts when we consider the economy as a whole. A person can be as greedy as he likes by accumulating as much wealth as possible, and he might derive great pleasure from possessing this wealth – but he is, at the same time, providing an altruistic service to the millions of workers and consumers by investing that wealth in the production of more goods and services that can be purchased at lower and lower prices. Additionally, we might as well mention that in the absence of a compulsory, so-called “social safety net” people rely on maintaining good relationships based on trust, reliability and selflessness with family and friends precisely so that they may be there for each other to cushion the consequences of the occasional unforeseen circumstance. Far from provoking any atomistic and individualistic existence freedom promotes and encourages a strong community and family spirit. If the virtue of altruism is to be nurtured then there cannot be a better place for it than there. In sum all of this reveals that, when considering societal wide, economic progress as a whole, focusing one’s efforts on people’s motivations or desires in achieving their ends is likely to be a waste of time. Rather, what matters is the method of achieving them – through peaceful, voluntary trade and exchange, and the investment of wealth in capital goods. In other words, it is far more worthwhile to forget about “greed” and focus instead on ensuring that more of our “greedy” entrepreneurs and businessmen make their wealth the honest way rather than through violently enforced state privilege, tax revenue, credit expansion and bailouts that definitely leaves them richer and us poorer. Moreover, it is only by pursuing that path that real altruism has a chance to flourish. 3Thomas Sowell, Barbarians Inside the Gate, and Other Controversial Essays. 4Occasionally the tax system does try to recognise this fact, albeit in an equally blunt manner. For instance, charitable giving can be made tax deductible. 7Ludwig von Mises, Human Action – A Treatise of Economics, Scholars Edition, pp. 669-70. 8For a detailed exposition on this topic, see George Reisman, Capitalism – A Treatise on Economics, Chapter 9, Part A. 9For a detailed explanation of this point, see Barry Bracewell-Milnes, Euthanasia for Death Taxes – Putting Inheritance Tax out of its Misery, IEA Research Monograph 54, Chapters 6-7.